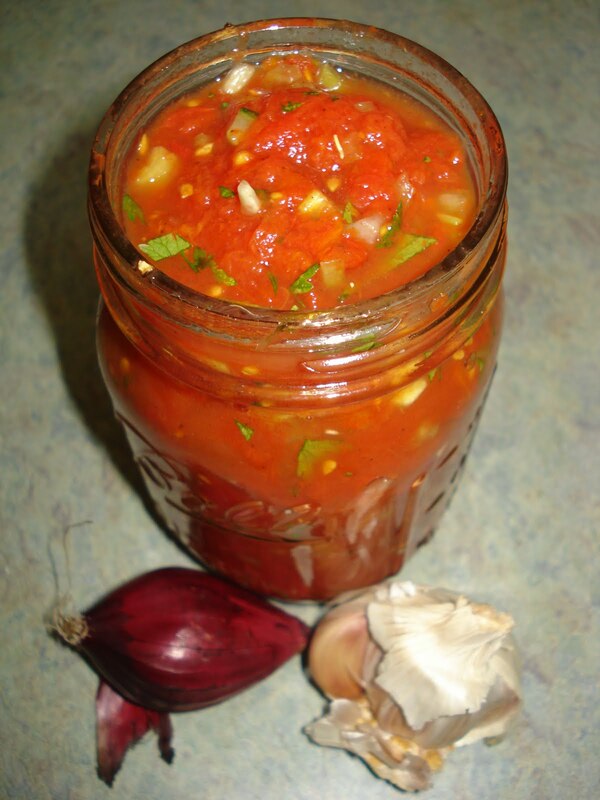 Salsa is a staple at our house, and has been for years. Tell me... WHO can live without tortilla chips and salsa? Or quesadillas with salsa? The occasional late night nachos with salsa? You get the picture. I used to have a truck load pumped into the house... back 'er up and fill the tank. Well, not really, but if felt like that. I would wipe out a whole shelf in the commissary each time I went. So, naturally after canning a gazillion tomatoes the light bulb went off as to how to use these red beauties and the first thought: Salsa. There are several recipes for this mainstay, here is my first thought, true blue, lip smacking good salsa experience. I call it "Dress Up" as I do not like to add the onions to a large amount as the flavor can take over, the same holds true with the garlic. So, I get to play in the kitchen before serving this to company, or to Dale and I as we head downstairs to watch a movie and 'mange mange mange'. Drain the tomatoes and save the liquid for a soup, or to add to other vegetables later. Combine all ingredients in a pint jar and refrigerate for later! Just before using, if desired, add 1 T finely chopped red or white onion, and 1/8 t garlic powder, or 1 clove of minced garlic. I think you will find this a repeatable recipe!